Evening gown and sable coat by Regina Friedländer. Home » Evening gown and sable coat by Regina Friedländer. Evening gown and sable coat, headdress and evening hat by Regina Friedländer. The small Loge. Evening gown and sable coat, headdress and evening hat by Regina Friedländer. Drawing of Offterdinger. Styl, table 1, Issue 5/6. 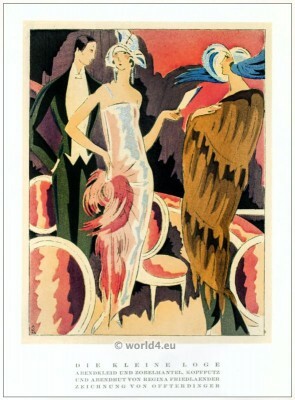 Source: STYL – 1920s German Art Déco Fashion Magazine by Ludwig Sternaux. Published in Berlin by Erich Reiss & Otto v. Holten in 1922 to 1924. This entry was posted in 1922, 20s, 20th Century, Art Deco Period, Germany and tagged Art Deco Fashion, STYL on 12/30/13 by world4.